Please, before you go to sleep tonight, think of ways you can reach out and help all the creatures out there “humans as well. Education, preservation, conservation are the keys to protecting all of our friends, including us, for future generations. If you see any of these friends on your travels give them a hug. Well, perhaps not all of them. So, if you run into one of these critters be kind to them. 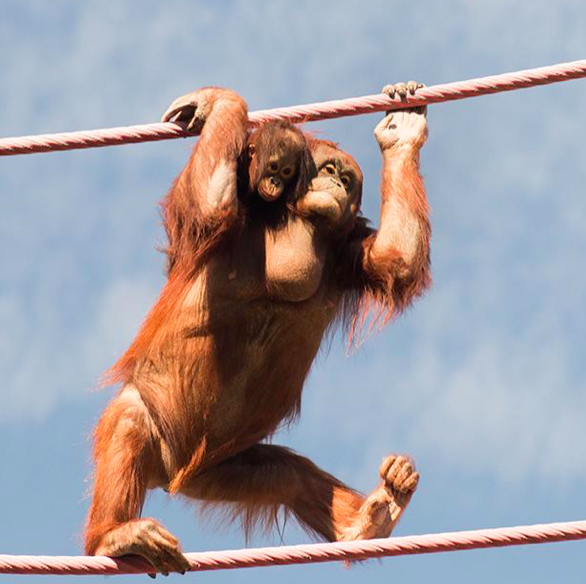 The photo showing an Orang crossing the Zoo grounds is from the National Zoo’s website. The following info is from their website. “Orangutans have long, sparse orange or reddish hair unequally distributed over their bodies. They have large jaws and flattened noses in concave faces. Orangutans are the largest arboreal mammals and are very well adapted to life in the trees, with arms much longer than their legs. They have grasping hands and feet with long curved fingers and toes. They have distinctive fingerprints and no visible external tails. You can typically tell male and female orangutans apart by looking at them. Males and females have flabby throat sacs, which become very large in adult males. Adult males have deep chests and much longer body hair than females do. Males also typically develop large cheek pads, which demonstrate genetic fitness and amplify their long calls. Orangutans can brachiate—swing hand over hand—but they normally move cautiously through large trees by climbing and walking. This allows them to distribute their weight among the branches. Orangutans’ hands make them graceful and swift while swinging, but it makes walking on the ground very slow and awkward. Orangutans sometimes travel on the ground when going long distances because appropriate sized branches may not always be available. When on the ground, they use all four limbs, supporting themselves on the sides of clenched fists, or occasionally walk on upright on two legs. Orangutans also come down if there is a need to find food and water elsewhere, for example, if there is a drought or fire. It can be difficult to tell Sumatran and Bornean orangutans apart. Generally, Sumatran orangutans are lighter in color, have longer body hair and less pendulous throat sacs than Bornean orangutans, but the only reliable way to tell the difference between Sumatran and Bornean orangutans is by looking at their chromosomes. Wild adult females weigh between 80 and 120 pounds (36 and 54 kilograms), while wild adult males weigh 170 and 220 pounds (77 and 100 kilograms). Animals in zoos tend to be 50 to 100 pounds (23 to 45 kilograms) heavier due to a consistent supply of high quality food. Orangutans live on the Indonesian island of Sumatra and in both the Malaysian and Indonesian portions of the island of Borneo. They are highly arboreal and live in all levels of the forest, from floor to canopy. Habitats range from peat swamp forests near sea level to mountainous forests almost a mile (1.6 kilometers) above sea level. As humans have moved into the lower elevations—the orangutan’s original habitat—orangutans have moved up the mountainsides. Orangutans are more solitary than other great apes and do not have as complicated a vocal repertoire as some of the more gregarious primates. Orangutans rely more on facial expressions and body language to communicate. Among the vocalizations they use are kiss-squeak and belching vocalizations when they are upset, and a loud, deep long call used typically by males for long-distance communication. This long call resonates in the male’s enlarged throat sac and echoes through the forest. It is used to locate and advertise the male’s presence to females or warn other males away. It can be heard a kilometer or more away (more than half a mile). Certain vocalizations such as nest smacks and throat scrapes are considered cultural and are found in some populations of wild orangutans but not in others. Orangutans eat primarily fruit and play an important role dispersing seeds through defecation. Although they spend a majority of their total foraging time feeding on fruits whenever they are available, orangutans also eat insects and flowers, and during times of fruit scarcity, fall back on a variety of other types of food, including inner bark, leaves, and other vegetation. Orangutans have also been observed eating mineral-rich soil, bird eggs and, occasionally, small mammals such as rats and slow lorises. Orangutans get water from a variety of sources, including tree holes and leaves that fill with water during the rainy season. When water is difficult to reach, orangutans chew leaves to make a pulpy sponge to soak up the water. Orangutans in some wild populations modify small sticks, which they hold in their lips while probing in tree trunks for food such as honey. Orangutans exhibit a variety of geographically variable innovative behaviors, some of which are considered cultural. Among these behaviors are certain forms of tool-use, including the modification of sticks by a population of Sumatran orangutans to open Neesia fruits and more efficiently harvest their seeds. Orangutans have a long period of infant dependency (weaning around age six or seven) with exceptionally long inter-birth intervals (at least eight years in Sumatran orangutans and a little bit shorter in Bornean orangutans). This may be at least partially due to diet. Mothers teach their infants what food to eat, where to find that food, in which trees and during which seasons. Young orangutans must learn about hundreds of varieties of fruit, where to find them seasonally and how to open them. In the morning, the orangutans at the Zoo are often fed together. Food items are cut up and spread over a wide area. In the afternoon, individuals are separated so each animal gets its share of preferred food items. In the morning, the animals are given greens, green beans, carrots, broccoli and primate chow. In the evening, they are given bananas, apples, primate chow, greens and a selection of other fruits and vegetables. Forage items placed in hay for the orangutans include air-popped popcorn, diced fruits and veggies, beans and sunflower seeds. Browse (fresh tree trimmings) is given daily. Orangutans live semi-solitary lives in the wild. While they are the most solitary of the great apes, it should be noted that orangutans are highly social and exhibit social tolerance during times of high fruit abundance when they come together in aggregations known as parties. Adult females travel through the forest with their dependent offspring. Females do not live in tight social groups, but they are familiar with and have relationships with other females in the area. Adult males have large home ranges that overlap those of multiple females. Males typically range alone except when they mate with females, forming consortships that last up to several weeks. Males may also join other orangutans of various sexes and ages in feeding aggregations. Individuals within a certain range appear to know others and interact comfortably when they encounter each other. Flanged males (males with flanges, also known as cheek pads) use long calls to attract females and to discourage the approach of other males. Throat sacs add resonance to long calls, which are specific to individual males. Orangutans of all ages and sexes give kiss squeak vocalizations, engage in branch-shaking displays and sometimes even uproot dead trees when confronted by unknown individuals or when they are not habituated to the presence of human observers. In zoos, displays consist of throwing around tubs and other objects. Orangutans’ social structure is connected to the distribution of food resources, primarily fruit. Orangutans spread out to get enough to eat throughout the year. Because they exhibit high social tolerance, orangutans are quite adaptable to living together when food is plentiful and when there is adequate housing space, such as at the Smithsonian’s National Zoo. Animals will segregate themselves as needed, and as males mature, they may become more territorial and often must be housed separately. Orangutans usually have a single baby, and twins are rare. Gestation is seven-and-a-half to eight-and-a-half months. From birth, orangutan infants cling to their mothers as they maneuver through the trees. The orangutan has the longest period of dependence on the mother of any other land-dwelling animal, including humans. Infant orangutans can nurse until they are six to seven years old. However, weaning is highly variable, depending on the mother. It is thought that weaning occurs sooner if food is abundant and the infant can switch to solids. A female will only have a baby about every seven to nine years, resulting in only four to five babies in her lifetime. The inter-birth interval is somewhat longer in Sumatran orangutans than it is in Bornean orangutans; researchers are still trying to determine why this is the case. After reaching adolescence at four or five years, these animals become increasingly independent of their mothers. Sexual maturity for males and females in zoos is around six years, although it can take up to 10 years or more for a wild female to mature and longer than that for males. Females may stay with their mothers until they are well into their teens, allowing them to observe mothering skills as they watch their younger siblings being raised. Physical maturity, especially in males, may not be reached for several years after sexual maturity. The presence of a fully mature dominant male may suppress secondary sexual characteristics (long hair, face pads, beards and enlarged throat sacs) in other less dominant males, and, in some cases, a wild male orangutan may never develop cheek pads. This suppression of secondary sexual characteristic does not, however, suppress his fertility, and it has been shown that unflanged male orangutans are as successful in siring offspring as fully flanged males. Most animals copulate only when the female is ovulating, but orangutans may copulate daily during several-day long consortships in the wild or when housed together socially in zoos. Research indicates that ovulating females seek out adult males for copulation. Females and males usually mate willingly, but sometimes a male will pursue a female and forcibly copulate with her. Both are natural behaviors for wild and zoo orangutans. Orangutans typically build sleeping nests above the ground in various positions of one or more trees. They usually build and sleep in a fresh nest each night, but they will sometimes re-enter or rebuild an older nest. They will also sometimes nap in a less carefully constructed day nest.